TestIT!2011, the second. Asus sends the X53E into the race for the Intel test campaign. The laptop, also equipped with an Intel Core i5 processor and its incorporated HD 3000 graphics unit, is supposed to especially stick out from the competition optically and haptically with a case made of aluminum parts. Asus sends the X53E into the race and has equipped it with an Intel Core i5 processor and its Intel HD Graphics 3000 graphics unit. The notebook is one of the few participants in the test pool that can excel with aluminum surfaces. This review will show if the splendor is of duration or if it soon loses its luster when a closer look is taken. 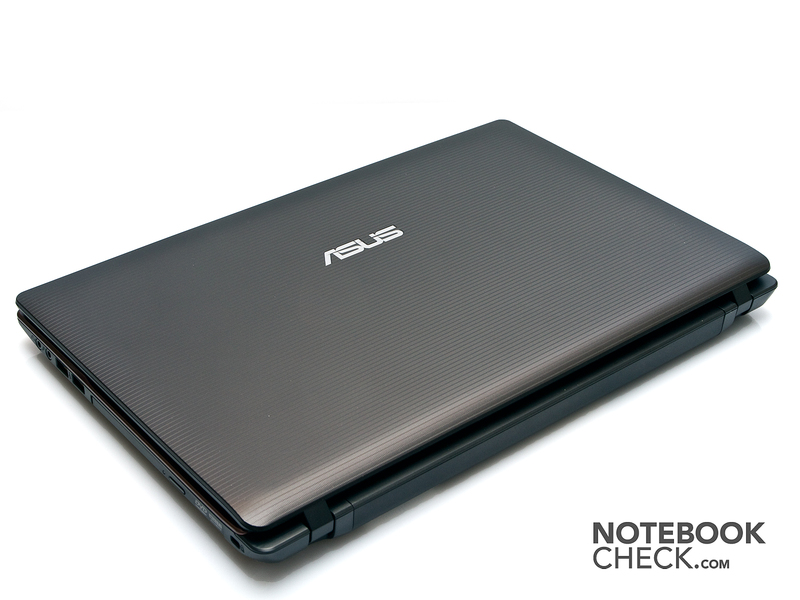 Alike the previously reviewed Asus K53, the Asus X53E notebook's case makes a very good first impression. The display lid's textured surface is attractive and even reduces fingerprints. But it can't completely prevent them, though. Unfortunately, the lid's torsional stiffness isn't particularly high. In addition, twisting the lid causes a creaking noise. No image distortions turn up. Both display hinges that keep the display on the base unit are quite small and don't initially look as if they could hold the lid securely. Nevertheless, display teetering is kept within limits and even opening with one hand is easily possible. 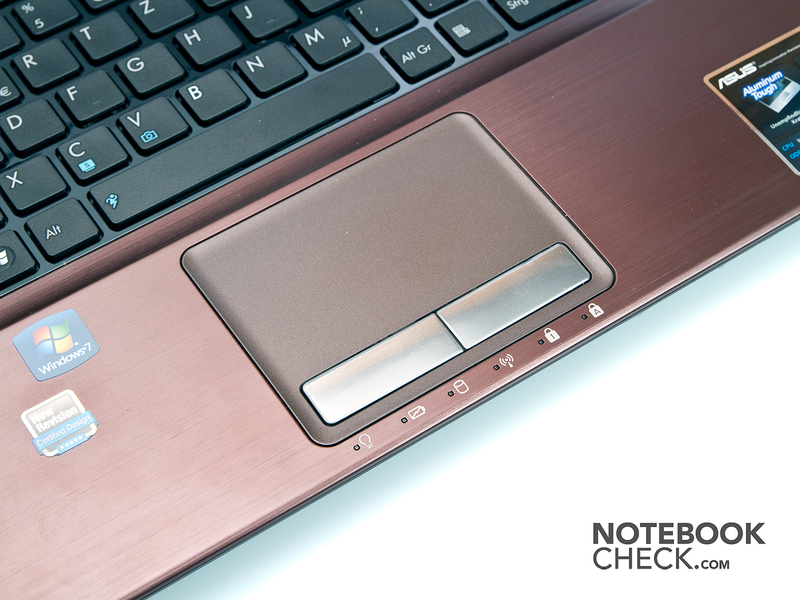 The notebook's aluminum surfaces are revealed when the laptop is opened. The base unit's entire top is made of aluminum, which naturally also contributes to the stability. For example, the wrist-rest and the area above the keyboard are very pressure resistant and also withstand even greater selective pressure. The keyboard is quite stable. It only starts to yield under medium, selective pressure. You'll soon notice that Asus has unfortunately placed almost all interfaces in the front areas when looking at both sides of the Asus X53E notebook. The sides are quickly cluttered by cables and there is a mess beside the laptop if the notebook is to be used stationary or if you have many peripheral devices. The majority of ports are especially found on the left, such as the power socket, VGA port, HDMI port and RJ45 LAN, which are all ports that are needed for a stationary use. There are fewer sockets on the right, but both USB ports are dangerously close to each other. A larger USB stick could cover the second port at the odd time. We also find the 4in1 card reader's position a bit adverse. It is on the front, but has been placed quite deep underneath the laptop. Thus, you have to lift the notebook slightly in order to access the card reader. The card reader supports the formats MMC, SD Memory Card, Memory Stick and Memory Stick Pro. The Asus X53E includes the option of connecting to the Internet via WLAN in addition to the obligatory RJ45 network socket. 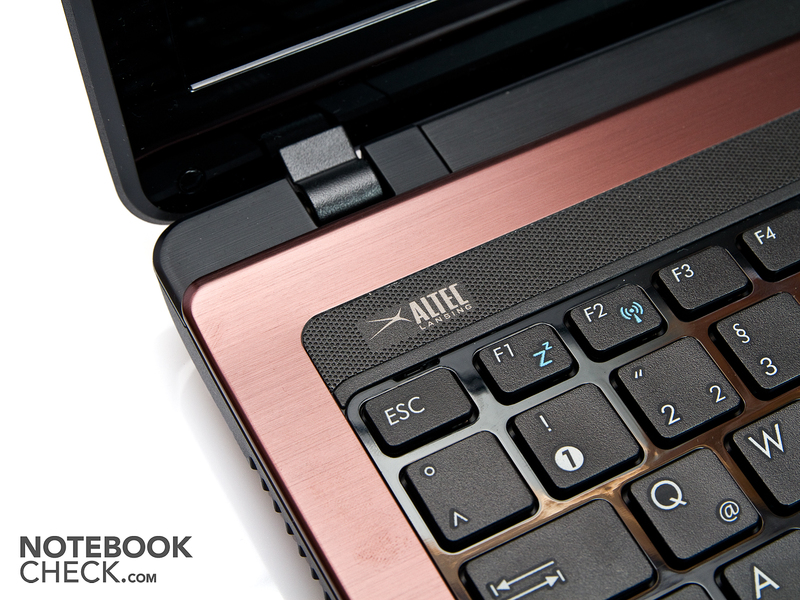 Asus has however omitted the option of connecting peripheral devices to the notebook via Bluetooth. The Atheros AR8151 Gigabit Ethernet adapter takes care of wired connections, while the Atheros AR9285 Wireless Network adapter is used for wireless connections. We only find the adapter with its power cable and a short quick start guide besides the notebook. Asus bids a 24 month manufacturer warranty period with pick-up & return service for the X53E. A model with a chiclet design (single keys) is used for the keyboard. The single keys measure 15x15 millimeters and have a slightly corrugated surface. They are nevertheless quite slippery. The gaps between the keys are 4 millimeters, which increases the accuracy when typing fast. The crisp pressure point and medium key drop convey a pleasant typing feel. Asus hasn't included any hot keys, though. All special functions have been placed on the FN function keys and have been marked with a blue icon. There is also a complete number pad on the keyboard's right, which will especially delight users who work a lot with numbers and spreadsheets. The installed touchpad has a diagonal of 115 millimeters and has thus turned out very big. However, the mouse keys are still within the touchpad, which limits the effectively useable area to a diagonal of 85 millimeters (53x63 millimeters). The touchpad also has a very smooth surface which allows the finger to glide easily over the surface. The touchpad always responded precisely to inputs. The touchpad also detected multi-touch inputs correctly and executed them smoothly. Overall, you can work well with the touchpad. Both mouse keys are within the touchpad's area and are thus a bit reduced. The keys have a short key drop and firm pressure point. In return, they clearly indicate if you have clicked or not with a sound. The keys' clattering noise when pressed is almost a bit too clearly audible, in particular in quiet surroundings (university, etc.). Asus uses a 15.6 inch display with LED backlight and reflective surface in its X53E. 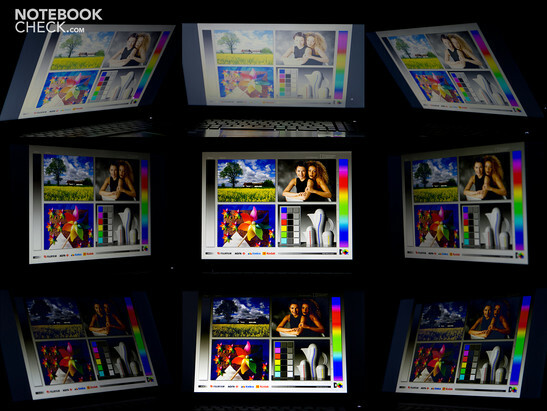 The display's resolution is 1366x768 pixels and consequently has an aspect ratio of 16:9. There are two options available for rendering the picture on a bigger monitor or over a projector. The VGA port sooner takes care of older devices, while the HDMI socket is conceived for newer flat screens and TV sets. Full HD (1920x1080) can also be rendered via these ports. The LED backlight boosts the brightness rates to a solid level. Although they don't achieve top rates, they put the notebook into a good midfield. 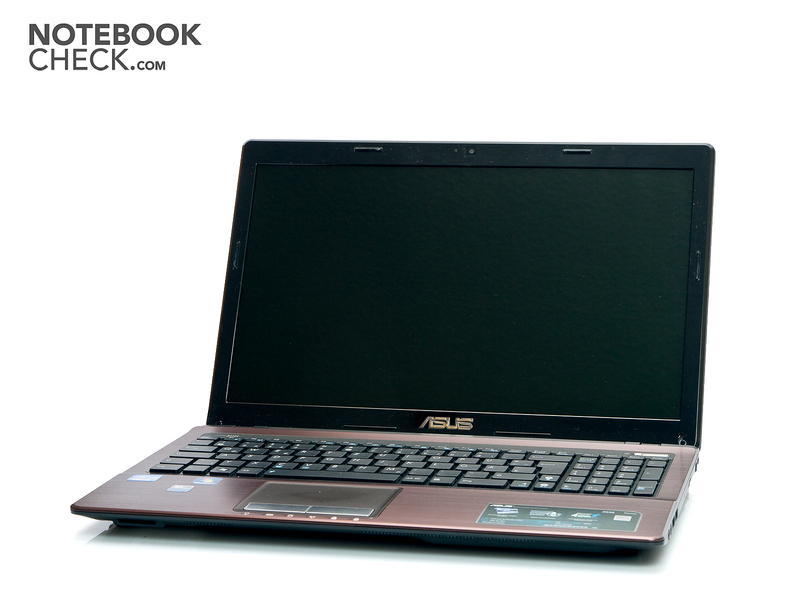 The Asus X53E and its display have no need to hide with a maximum brightness of 238 cd/m2 and an average of 227.7 cd/m2. The screen's illumination of 91 percent is also quite impressive. Unfortunately, the black value of 1.6 cd/m2 has turned out rather high, and has a negative impact on the display's contrast. It consequently is only 145:1 and regrettably can't convince subjectively, either. The Asus X53E's screen surprised us in terms of color reproduction, even if it basically remains within the expected level for a low-priced entry-level device. The sRGB color spectrum can't quite be covered and thus the device is eliminated for professional users (graphics, picture editing, etc.). That won't bother the average user, though. The Asus X53E laptop's screen scores averagely in outdoor use. Thus, the reproduced image benefits from the display's good brightness. However, the low contrast and the reflective surface weaken the legibility of the screen's content in return. It would make more sense to look around for a shady place with the laptop. The image is quite stable as long as you look at the Asus X53E's display from the front. This even allows you to comfortably sit in front of the notebook with several people without the picture distorting massively. However, as soon as you tilt the screen, the image clearly worsens fast and the colors invert or the image fades. But that is the rule for screens of this price range. The Intel Core i5-2410M installed into the Asus X53E is currently a popular used processor. Many new laptops have this midrange processor from Intel since it promises an attractive performance/money ratio. The dual core processor has a healthy amount of performance with a base clock of 2.3 GHz. Four threads can be processed at the same time thanks to Hyper Threading in connection with both cores. The processor overclocks itself autonomously with assistance from Turbo Boost 2.0 should the base clock not suffice at one time or another. The clock rate can be increased to 2.6 GHz (both cores loaded), respectively 2.9 GHz (1 core) depending on how many cores are needed for the application. The necessary processor cooling has to be ensured, though. When the processor is compared to the processors of the prior generation, the Core i5-2410M is on about a par with the Core i5-560M with 2.7-3.2. The new processor can partly overtake the older, and actually faster, model. The Intel HD Graphics 3000 solution incorporated on the graphics card is used as the graphics card. Built-in graphic cards usually don't have a particularly high amount of performance. However, a big step has again been taken with the new generation of incorporated GPUs. Thus, the HD Graphics 3000 is now on about the same level as the Nvidia GeForce 310M. One of the Intel graphic card's big advantages in contrast to dedicated graphic cards is the power consumption. While dedicated graphic cards additionally drive up the system's power consumption, the built-in graphics is already in the processor. Thus, economic and low-priced systems can be set up without much effort. Nevertheless, the Intel HD Graphics 3000 card isn't absolutely unsuitable for the latest games. Although they usually have to be set to the lowest detail level, they can be played smoothly to an extent. The device reaches 4606 points in the Cinebench R10 (64bit) test (1 core) and places itself in the upper midfield of comparably equipped notebooks (2410M CPUs). The recorded clock rates were 2.6 to 2.9 GHz during the test. The X53E achieves 9631 points in multi core rendering and thus also remains in an inconspicuous midfield of 2410M notebooks. The CPU's frequency stayed at a constant 2.6 GHz, so the chip's turbo capacities could also be exploited in the Asus X53. 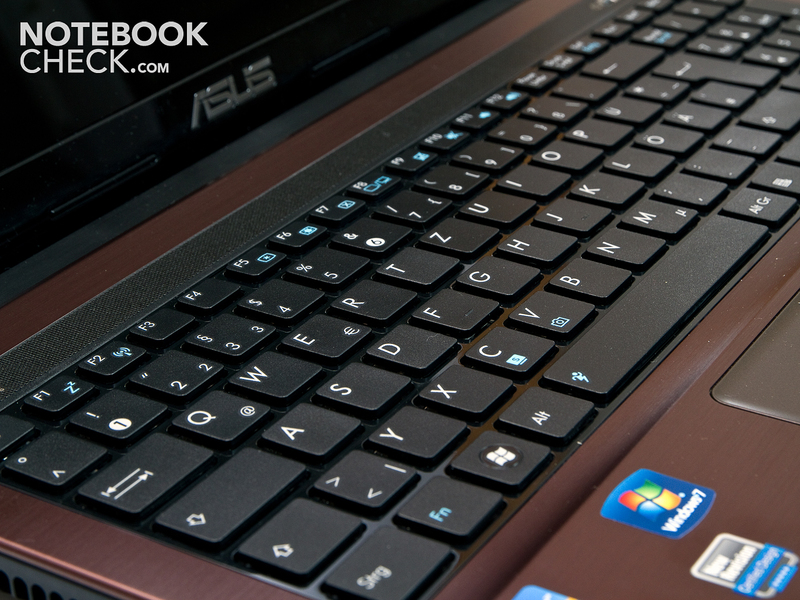 The Asus X53E scores rather average in our PCMark Vantage test. It is roughly in the center of our benchmark tests. With a total score of 4887.0 points, it shares the chart's midfield with laptops such as the Acer Aspire 7740G-434G64Mn (430M, HD 5470) with 4893.0 points or the MacBook Air 13 inch from 10-2010 (SL9400, GT320M) with 4882.0 points. An equally equipped notebook (also from the Intel TestIT!2011 campaign) has a somewhat higher rank in the chart. 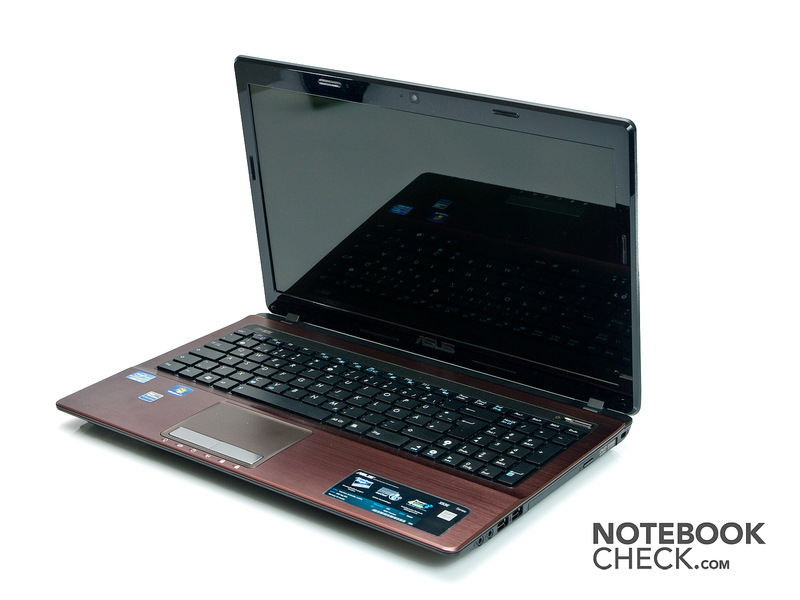 The Packard Bell EasyNote TS11 (2410M, HD Graphics 3000) has quite a lead on the Asus notebook, with 5215.0 points. The Asus X53E laptop also lags behind the Packard Bell notebook with 2158.0 points in our still fairly new implemented benchmark, PCMark 7. The Asus X53E notebook's ranking drops clearly in the tried and tested 3DMark06. 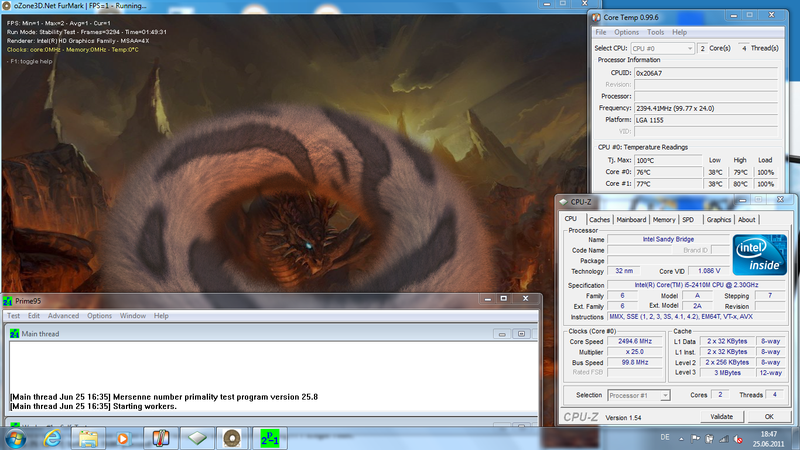 The very graphics heavy 3DMark pushes the incorporated Intel graphics to its limits, which is also noticed in the result. The Asus laptop achieves 3609.0 points here. The competition again scores better here, as well. For example, the Lenovo IdeaPad Z370 (2410M, HD Graphics 3000) is clearly superior to the Asus notebook with 4589.0 points. 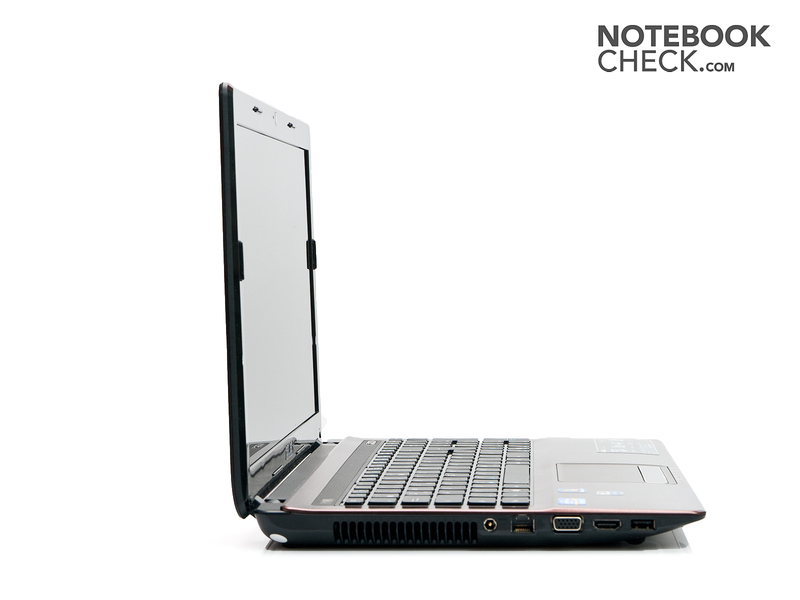 Even the Packard Bell EasyNote TS11 (2410M, HD Graphics 3000) can surpass the Asus X53E notebook with 4607.0 points. We weren't able to analyze this difference in 3DMark in detail because all tools refused to read out the HD Graphics 3000 clock rates. A Western Digital hard disk with a (gross) capacity of 500 GB is used in the Asus X53E as the hard disk. The WDC WD5000BPVT-80HXZT1 is a 2.5 inch hard disk that rotates with 5400 rpm and is also used in the Packard Bell TS11, for example. The hard disk can't exactly stand out with its performance rates and sooner goes unnoticed in the broad mass of laptop hard disk. The access times of 20.5 milliseconds are a bit long while the transfer rates are within an acceptable range. We again used the real time strategy game StarCraft 2: Wings of Liberty for the gaming test. The scenario "For the Swarm" serves as a reference. Although everything could still be rendered smoothly in the lowest resolution with the lowest details, game play was only possible with stuttering in higher settings. Thus, the Intel Graphics 3000 regrettably isn't suitable for more than casual gaming. More information about which games run smoothly on the HD Graphics 3000 can be found in our big comparison: "Computer games on laptop graphic cards". 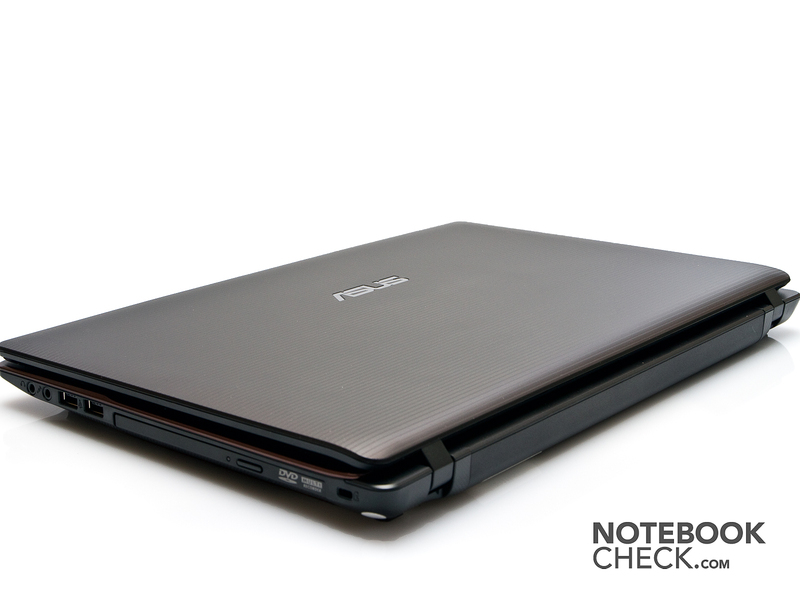 The Asus X53E proves to be pleasantly quiet in idle. A very quiet whirr is audible with a noise of 30.6 dB – 31.3 dB, but it's not disturbing in normal situations. Even the occasional hard disk's activation is still tolerable with 32.2 dB. 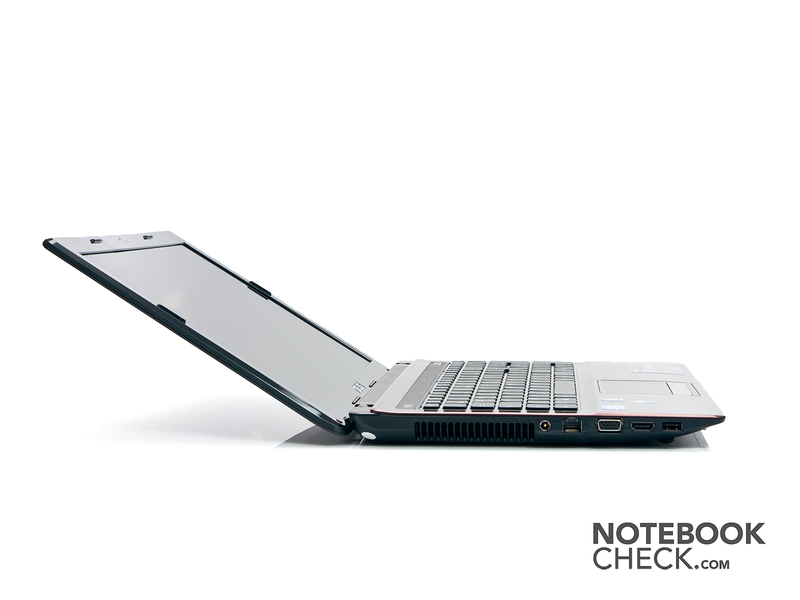 The notebook's cooling system gets louder during full load. The laptop reaches a noise level of 34.6 dB – 36.2 dB. But the laptop isn't really loud with that yet. The recorded surface temperatures are all within a reasonable range. But that's not surprising because the notebook doesn't have a dedicated graphics card that produces additional heat, anyway. The Asus X53E laptop reaches a maximum temperature of 31.6 degrees Celsius on its top during load (stress test, CPU and GPU 100%). The front area, where we find the wrist-rest and touchpad, even stays cooler. The wrist-rest heats up to 27.0 degrees Celsius (left) and 26.6 degrees Celsius (right). The touchpad heats up to 27.5 degrees Celsius. Thus, the wrist-rest always remains agreeably cool. This can likely be ascribed to Asus' IceCool technology, which is supposed to keep the wrist-rest cool at all times and could show its capabilities in the Asus K53. The bottom's temperatures also convince. A maximum of 38.1 degrees Celsius is reached here, which also stands for an uncritcal rate. Thus, the laptop can be placed on the thighs in the summer without problems and without it ever getting uncomfortable. There is absolutely no need to worry about the notebook getting too hot in idle. All temperatures are below the 30 degrees Celsius mark, and the notebook consequently is only just lukewarm. The wrist-rest is uncritcal with 24.5 degrees Celsius (left) and 26.7 degrees Celsius (right) and the touchpad is also sooner cool than warm with 25.1 degrees Celsius. The bottom doesn't represent a problem either with a maximum of 28.2 degrees Celsius. We attempt to push the laptop's cooling system to its limits with our simulated full load test. We use the programs Prime and Furmark for this. The program Core Temp / HWMonitor is used for evaluating the temperatures. Core Temp indicates a maximum processor temperature of 80 degrees Celsius (estimated) after almost two hours of load. Thus, the Asus X53E supplies a very good rate, which is clearly below critical rates. The subsequent 3DMark06 benchmark also didn't give reason for expecting that the laptop wouldn't be able to supply the full performance in a heated state. The Asus X53E notebook achieved 3600 points in 3DMark06 after the stress test, which is also roughly in the range that the notebook achieved in a "cold" state. Asus advertises with the fact that Altec Lansing speakers have been installed into the X53E. They actually provide a more balanced sound subjectively than expected for this device category. The produced pitches appear to be clearer than we are used to from other laptops. Nevertheless, you still have to live without basses since they do sound very flat. The Asus X53E benefits from its 58 Wh battery, and of course the installed hardware, in the battery runtimes. Thus, the laptop achieves an impressive 7 hours and 28 minutes in the BatteryEater Reader's test. A battery runtime of still nearly 4 hours remain in the practical WLAN surfing test. However, the battery is quickly drained in load (BatteryEater Classic test) and only lasts for 1 hour and 31 minutes. You have enough time to watch even longer movies to the end with about 4 hours if you want to watch a DVD on the go. But, the good battery life also takes its toll. Almost 3 hours (2 hours and 52 minutes) are needed to completely recharge the battery. The usual 8.8 watts - 13.5 watts are consumed in idle. 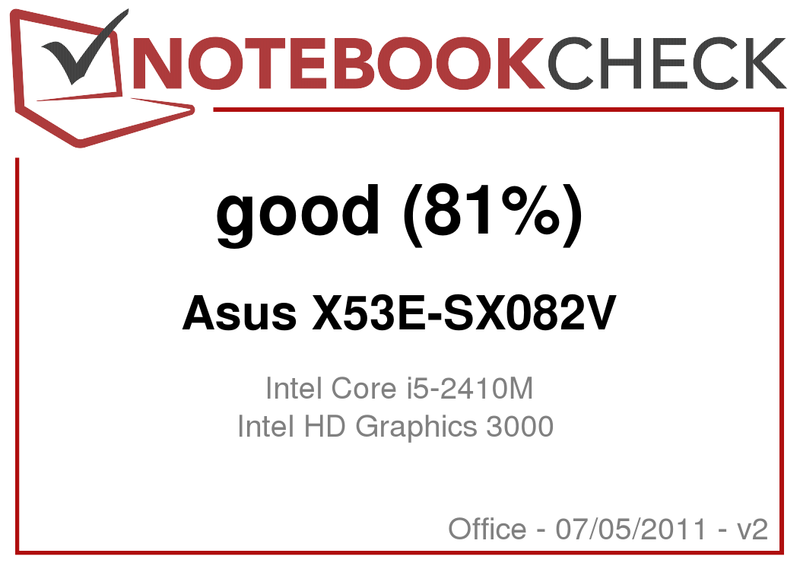 The Asus X53E notebook is on a par with the competition during load: 38.3 watts – 56.8 watts are quite normal rates for this category. The included 65 watt power adapter also has a sufficient capacity. The Asus X53E leaves us with a positive impression in many points. The case is robust and can also excel with the selected materials. The design proves to be quite resistant to fingerprints in contrast to many other design alternatives that use high-gloss elements. We are even satisfied with the keyboard. It allowed us to work comfortably even over a longer time, especially since a workday with the X53E could turn out to be a bit longer than usual. The battery supplied good runtimes as long as the notebook wasn't put under too much load. 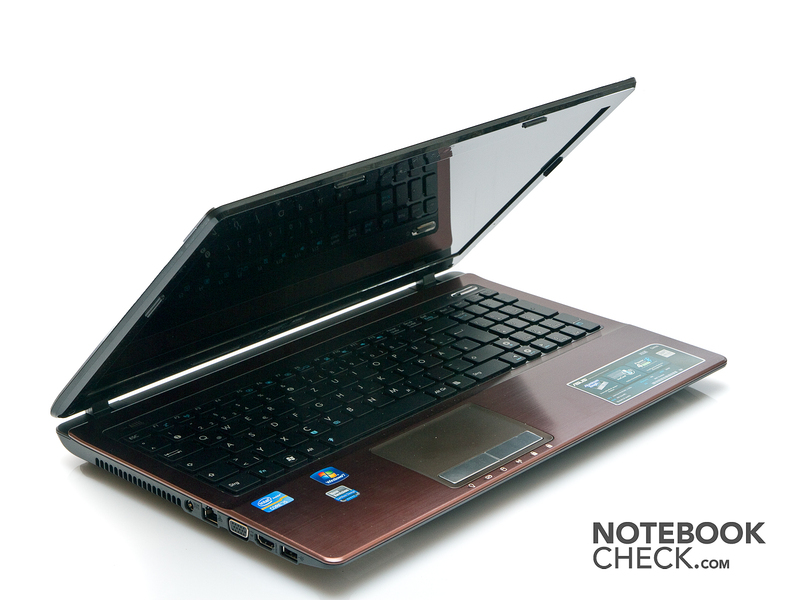 In terms of performance, the laptop delivers what can be expected from a Core i5-2410M and an Intel HD Graphics 3000. You are sufficiently equipped for undemanding office tasks with this combination. Besides the loud touchpad keys, only the display gives reason for complaint. Although the brightness was adequate, the display couldn't convince with its contrast and during outdoor use. If you are looking for a notebook for surfing, writing, watching movies and listening to music, you are well advised with the Asus X53E in many aspects. However, if you primarily want to play games or run power applications, you should look around for a stronger device. The Asus K53 would be a good alternative in this regard, as it fuses more power with a few qualities of the X53. 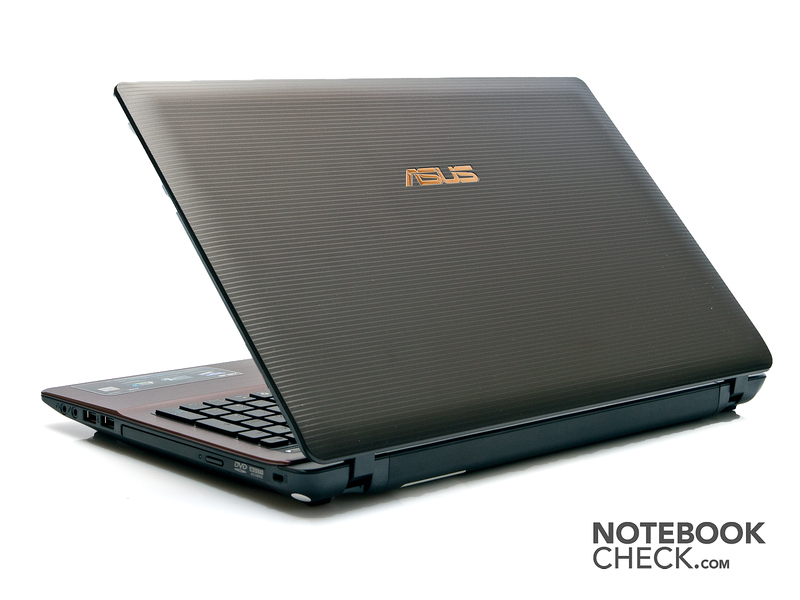 First impression: The Asus made a quite high-end impression with its textured, brown surface. The surface's haptics also made a good impression, in particular because the bottom proved to have the same handling feel. The brushed aluminum surface around the keyboard particularly made a good impression when it was first opened. There weren't loads of stickers, like known from other manufacturers, on the wrist-rest, either. The case: As mentioned in first impression, the case is pleasant to touch. It has an all-over high-end look due to the textured surface. The base unit has a very high torsional stiffness and makes a rock solid impression. The keyboard is the only weak point, since it yields slightly under pressure. But that wasn't seen as annoying. The rest of the base unit doesn't give reason for complaint. There aren't any thin plastic parts that stick out even from the bottom side. Fingerprints hardly have a chance because of the selected materials. In return, the display bezel seems a bit weaker. A slight twisting is possible. However, it is also fairly marginal. The display lid can be dented especially in its center. The display bezel is, alike the display, clad in high-gloss and tends to collect fingerprints. The large opening angle of more than 135° was pleasing. The hinges aren't quite smooth, but on the other hand, they have a firm grip on the display. There is no teetering. This is also vital because the laptop doesn't have a latch to keep the display closed. In a closed state, there is a small gap between the display and keyboard due to the slightly submerged keyboard. Thus, you have to reckon with dust and dirt penetrating there. The keyboard is pleasing with its so-called chiclet design. Where the keys stand alone. This is a clear advantage for cleaning between the key gaps. The input devices: In addition to the nice-to-look-at chiclet keyboard, the complete number pad is striking. It needs a bit of getting used to because it has a narrower layout than the other keys. It may only be a thing of accommodation for some, but it's always confusing for me: The "Crtl" and "FN" keys. Asus has opted in favor of placing the Ctrl key on the outer left. I like this more because I usually tend to hit the Windows key instead of the Ctrl key on notebooks. Another - not quite as pleasant quality - are the arrow keys, which are barely separated from the keyboard. The "PGUP" key shares the place with the shift key. The "right" and "down" key fight for space with the right Crtl key. They don't stick out by means of larger key gaps. The typing feel is quite good. You have a good pressure point, the keys make a slightly clattery impression and could do with a slightly longer key drop. The Asus doesn't have any separate hot keys. The most important functions can be controlled via the FN keys. The touchpad couldn't really convince me. The keys were too stiff for permanent use in my opinion. The touchpad has been generously sized and is capable of multi-touch gestures, but they weren't really convincing. The notebook responded rather slowly to zoom commands and, in my opinion, they don't make as much sense in laptops as in smartphones. On the other hand, the touchpad doesn't have a scroll bar on its right. I noticed adversely during use because you do have to scroll more frequently on widescreen notebooks. The display: As previously mentioned, the display is a reflective member of its kind. The resolution is average with 1366x768 pixels. I also noticed the display's high luminosity positively. In contrast, the screen's color space made a rather weak impression subjectively, just like the contrast rates. You can't evoke a deep black from this display. Too bad for the notebook, because you do look forward to these things in members of the multimedia category. The typical weakness of reflective displays turns up in outdoor use. You see more of yourself and your surroundings than of the screen's content in good weather. You can still rescue a bit by setting the display's brightness to maximum, but that naturally consumes additional battery power. I would say that the viewing angles are good. The screen is insensitive to oblique viewing angles especially horizontally. But the screen is also quite stable vertically. The speakers: Asus makes an attempt to stick out from other laptops and to meet the claim of being a multimedia entry level device with speakers from Altec Lansing. This is even partly successful. Of course, you can't expect any miracles in performance. But, the speakers can serve with an acceptable sound for a notebook. There is - for notebook speakers - a good measure in the base pitch ranges, and the trebles don't squeal, either. However, it is still remote from sufficing audiophiles' demands. But you simply have to pay tribute to the idea. Application and gaming performance: The application performance seemed to be more than sufficient for most applications in the test. The Core i5 2410 has enough power for only music and video rendering, just like for most requirements of home users. A stronger processor could be of help for video editing. But, that shouldn't be considered in view of the display anyway. The graphics card also has a bit of power for gaming. You can even play games, such as StarCraft 2, in low graphic settings. However, the picture quickly stutters in situations with many units and effects. Noise and heat development: There's not much to complain about in terms of noise and heat development. The Asus is fairly quiet in office mode and you don't hear the fan at all. The fan starts up after a short time when you open processing intensive tasks, but it wasn't perceived as annoying. Even the heat development is within limits. In particular the wrist-rest never got even close to being unpleasantly warm. It partly gets a bit warmer at the vent and selectively on the bottom. However, it never got even close to being so warm that I couldn't place the notebook on my lap or that it threatened to get unpleasant in the long run. Battery life: I was also pleasantly surprised about the battery life. The laptop achieved a bit more than three and a half hours of normal use (surfing, word processing) on a rainy day, where I didn't have to run the display in its highest brightness. It is allegedly even more than 6 hours of battery life in minimum mode. Although I didn't try that, I believe the notebook would last that long. You don't have to fear missing the end of a movie when you want to watch a DVD, either. There was still time left to google a few facts about the movie and listen to a sound track at Napster after a 140 minute movie. The notebook still even lasted for more than 90 min. in maximum load by me. Verdict: Basically, I would give the laptop a "good", based on the fact that it is an entry level notebook. In my opinion, the strengths are found in the case's haptics and optics, as well as in the torsional stiffness. The display is bright and the viewing angle stability as well as the speakers are more than the usual fare for notebooks. The pure office performance is also more than convincing. The emission rates, so noise and temperature, also convince and even allow use in the office. 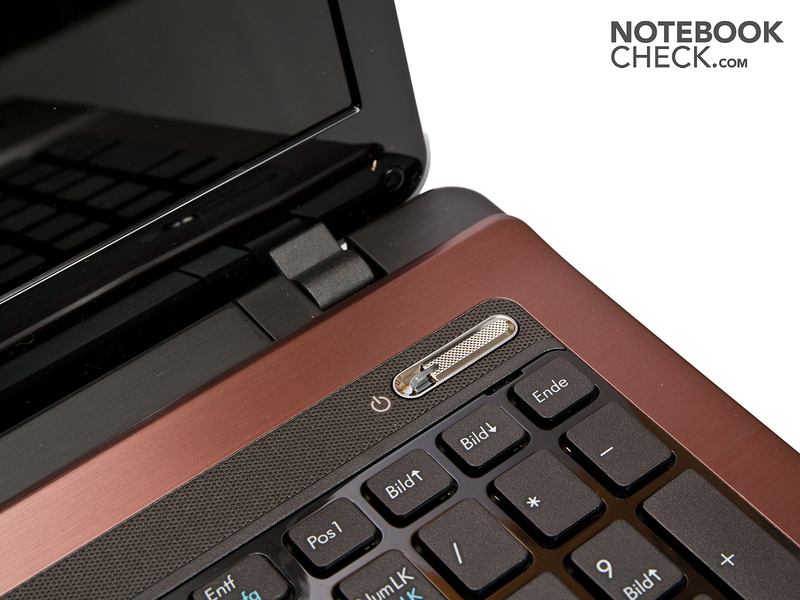 Furthermore, the good battery life, which allows using the laptop on the go, has to be highlighted again. The narrow color space and the reflective display, as well as the few and unfavorably positioned ports, have to be pointed out on the con side. Nor has the keyboard been designed for prolific typists in my opinion. The other things are limited to minor flaws that aren't as annoying in routine use. We were denied access to the notebook's innards, though. The keyboard also convinced us. The hinges don't make a particularly stable impression at first glance but they do their job. The sound system comes from Altec Lansing. However, the opening angle isn't particularly wide. A successful eye-catcher even from the side. comes along with aluminum surfaces and a reflective display. 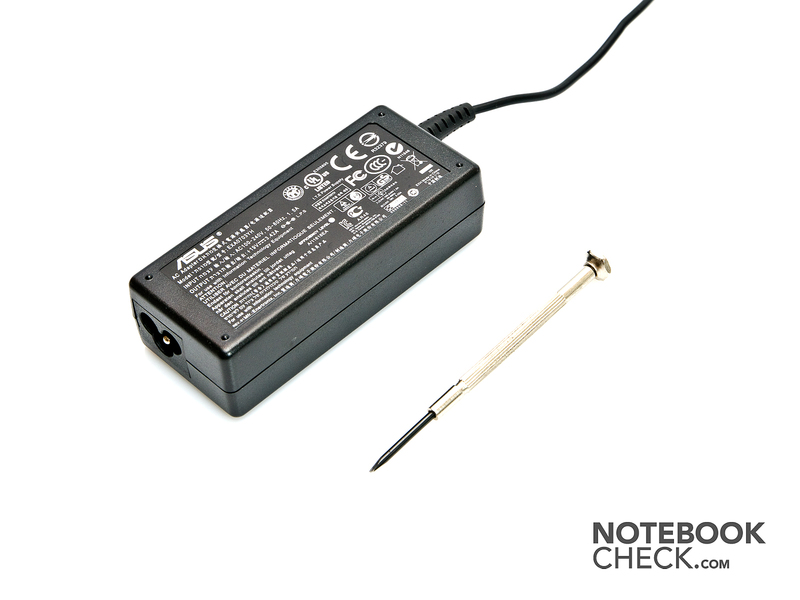 The 65 watt power adapter could always supply the notebook without problems. 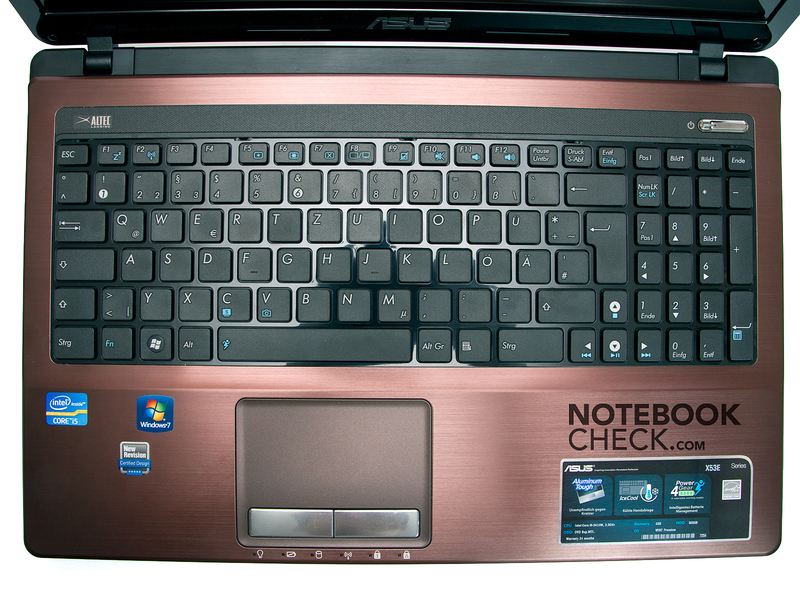 That Asus considers the material a bit and also uses aluminum in its notebooks with an entry level configuration. A better interface positioning. Asus has simply distributed all ports in the notebook's front area. Potential competition is found in almost every notebook that participates in the TestIT!2011 campaign because they all have an almost identical configuration. 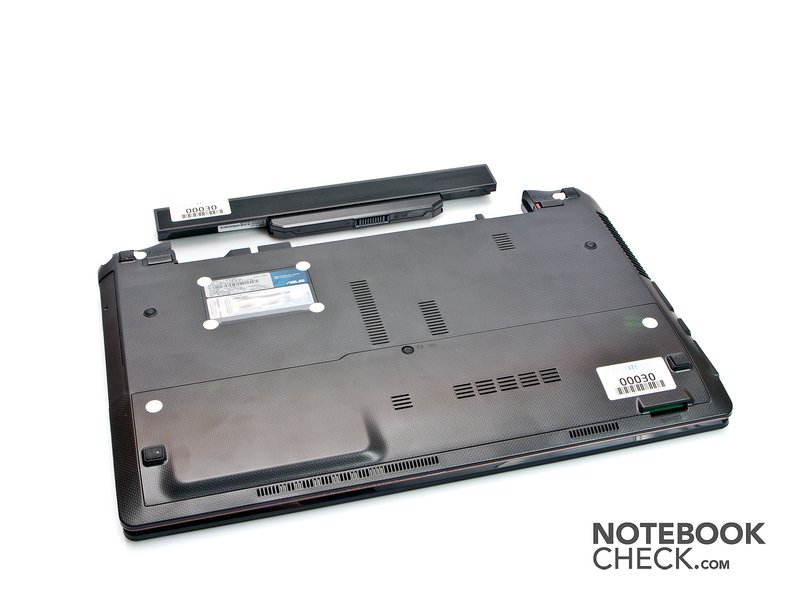 Thus, the Packard Bell EasyNote TS11 that was in for our tests recently with an Intel Core i5-2410M and Intel HD Graphics 3000 is a very serious rival for the Asus X53E. Others will follow.